Two ten-year-olds meet on the top of a sacred hill: Coyotl and Kuini. One is the son of a local ruler who’s just found out that his mother was made the First Wife and him – the heir apparent. The other is the Highlander boy, the youngest in his family, with a War Lord for a father. After a while they find out that, instead of fighting, they can teach each other a lot. That’s how an unusual bond of friendship is created, a bond which will be tested many times because the beginning of the 15th century in the Mezo America was hardly a peaceful period. Will both boys stay friends or maybe they will be forced to fight against each other? Will Coyotl inherit his father’s throne? Firstly let me tell that I am a sucker for original settings like Asia, Latin America, Antarctica or Australia (huh, an accidental alliteration anyone? ;p Let add the New Zealand to the bunch, it sounds much better) – that’s how I found this novel and a truly delightful blog of Zoe Saadia, its author, who kindly contacted me on Twitter afterwards and offered one of her books for free in exchange for an honest review. I accepted it gladly. Her blog is a place full of interesting information about different cultures of the Latin America before the Conquista; visit it, explore, and watch a guy scaling a pyramid or your cursor turning into an obsidian dagger! Ok, my childish enjoyment apart, the site shows clearly that the author knows what she is writing about – as far as it is only possible of course – and she can present it in an enticing way, a great intro, able to whet my appetite for more Mexica Aztecs, Tepanecs, Chichimecs, Tolmecs and, of course, the big-headed Mayas ! Of course even the best setting cannot make me like a book with flat, boring characters but The Highlander clearly exceeded my expectations. Both Coyotl and Kuini were boys whose steps I followed with pleasure. Their friend and love interest, Iztac-Ayotl, the half-sister of Coyotl, was a force of nature on her own, a girl as fierce and independent as any of the warriors. There were no clearly-defined baddies although the mum of Iztac did her best to deserve that name; fortunately or unfortunately she featured in too few scenes to play a really important role. Maybe later in the series she will be given more time. Sometimes I got the feeling that the author wrote her characters as too contemporary, making them say things like “all right” and such. I understand that these were teenagers and it would be difficult to find any source material to quote everyday language of Latin American teens from that period but I felt it was just a tad too close to our own times. I wish they had their own expressions, perhaps even more colourful and of course completely fictional but still. The novel doesn’t pass the Bechdel test which made me a bit sad. It’s not that there weren’t any opportunities: Iztac, living with her mom in the women’s quarters, must have had a trusted female friend or/and a servant, right? Would it hurt to include one short scene with these two talking about clothes or food? Even her mother, the scorned ex-First Wife, would do, e.g. berating her daughter for her behaviour. I wish Coyotl, Iztac and Kuini all the best and I am eager to check how they’ll manage the adulthood so yes, I would like to read the rest of the series, I would like it very much! Even if it makes me crave some tortillas or tamales not to mention, of course, cocoa beans! We owe chocolate to the people of the Latin America after all and much, much more! 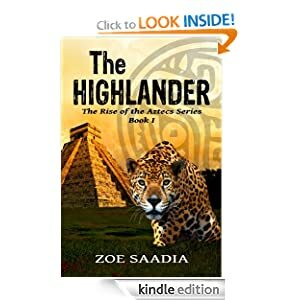 This entry was posted in book review, historical, read in 2013, recommending and tagged series alert, The Highlander, The Rise of the Aztecs, Zoe Saadia. Bookmark the permalink. Pardon my ignorance, but what is the Bechdel test? Somehow it worked for me more or less. Depends on the book I suppose. A good author makes you accept whatever she (or he) writes. And if something is off, sometimes the whole book is off. I am glad you enjoyed this one overall. Yes, overall it was good and I kept in mind the difficulties the author had to face while researching her sources.